Hello, friends! I receive a lot of questions about the health benefits of infused waters, especially the nutritional value of each recipe. The truth is that the main health benefit of infused waters is HYDRATION. While you do gain some nutrition from each infused fruit, you do not ingest the same fiber, nutrients, and vitamins as you would when blending fruits/veggies and drinking them. In addition, measuring the exact nutritional density of infused waters is also difficult because of how long, at what temperature, and in what amount of water you infuse your ingredients. What makes infused waters so great is that you are supplying your body with pure water that has been slightly flavored by fresh fruits and herbs, both of which naturally contain water! Infused waters are superior to “vitamin waters” that are made with artificial coloring and chemical vitamins and, of course, far superior to diet sodas that are loaded with caramel coloring and aspartame. Infused waters are also great for those of us who get bored of plain water, which sounds spoiled to say, but does happen if you are committed to drinking a lot of water every day. If you are concerned about getting a full spectrum of vitamins in your daily diet, I highly recommend starting your day off with a green smoothie. Today’s powerful blenders make it very easy to make a smoothie on the go. I personally start every morning with a green smoothie made in my BlendTec using coconut water, kale, fresh ground flax seeds, avocado, spinach, and…whatever green veggies I have in my fridge. Green smoothies truly make you feel radiant. Throughout the day, I’ll sip on my infused waters, knowing that I am supplying my body with an optimal water source on top of a nutrient-dense diet. These are the best two gifts you can give your body: adequate water intake and a daily vitamin load from natural, fresh plant sources. Cheers to your good health and hydration! I have recently begun making my own infusions. I am having fun and feeling good. I am hesitating to get a pitcher. I think it would be hard to clean. I like that ball better. Hi, Angela. There are benefits to both devices. I really love my Prodyne pitcher because its “core” can hold a lot of fruit and allows me to make bigger batches of infused water. You’d be surprised at how easy pitchers are to clean. Just like a water bottle, pitchers are not subjected to sticky foods, so they barely need more than a good rinse. 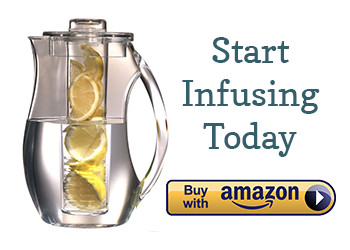 I would like to know , what kind of water do you use for the infuse water, Can I use boiling water. Boiling water is not a great idea because it destroys all of the fragile nutrients in fruits and vegetables. However, if you are in a hurry, you can use hot, but not boiling water, to pour over your infusion. Let the infusion rest on the counter for five minutes then immediately transfer it to the fridge. You will not receive the same nutrient boost as a cold water infusion, buy hey, you are still getting hydrated and enjoying drinking water instead of soda! Is there any particular recipe for infused water or I can mix any fruit or vegetable whatever I want for maximum benefits ?? i enjoy my water at room temperature. it’s it necessary to refrigerate my infused water to maintain freshness? what’s the shelf life at room temperature? Hi, David. Infused waters should be fine at room temperature for 12 hours (including infusion time). Over 12 hours, you should refrigerate the water to prevent bacteria from forming. Think of your waters in the same way as fresh fruit: you would not eat a cut orange out that had been left on the counter all day. 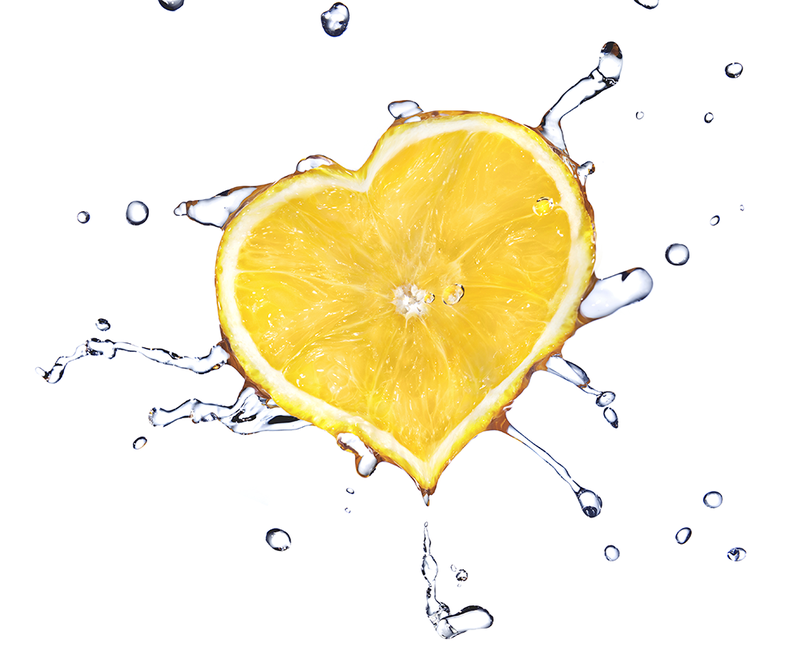 Do you use the fruits in your smoothies after having used them to infuse your water? I’ve found that whether or not the ingredients can be used for a refill varies. Strawberries and peaches I’ve been able to get one refill, citrus I can usually get two refills. Melon, especially watermelon, tends to be single use. Herbs I’ve found I can general get two refills from but I have to mash the herbs a bit to release flavors for the last one. The fruit to water ratio and length of infusion may increase or decrease the number of uses you get from the ingredients. In addition, the quality of the fruit will influence how many uses you can get out of it. Bland, underripe fruit will provide less flavor to the infusions. Whether or not you can re-use the fruit depends on a few other things, for instance whether or not you’ve kept the water refrigerated. For safety reasons you wouldn’t want to refill fruit from water that has been left out all day. Even refrigerated, I personally wouldn’t re-use fruit that’s sat in water for more than 5 to 7 days (although I’ve never actually had fruit sit in water that long, it’s always been finished in a day at most). Also, if you filter your tap water before using the fruit it picks up the flavors better and, depending on the ingredients, you can sometimes get an extra refill. If you use milder flavored ingredients with stronger flavored ingredients (i.e. strawberries with black pepper, peaches with mint) it may throw of the flavor if you re-use them so you may need to add extra of the milder flavor. As for using the fruit after infusion, you would want to just eat it, the flavor has been leached out and the texture breaks down. So long as you’ve kept your water refrigerated you can throw the fruit in a smoothie with ingredients that haven’t already been used for infusions and it adds bulk and fiber to it. Most of the time I just end up throwing it out though. But you generally use a relatively small amount of fruit and herbs to flavor the water so it’s not a huge waste. Wouldn’t want to just eat it the used fruit. Sorry about that. Hi I would like know which recipes for the infused water are best for people with high blood pressure? Hi Amy, thanks for the post, I learn something from it. I have really enjoyed making and drinking infused water. I have tried different recipes, that I can say, is really tasty. My question was answered, about reusing some of the fruits. Thanks for sharing! i have not done infusions yet, but it sounds amazing. I will be trying it soon and will most likely do it everyday while at work. glad I found out about this. How can the infused water be preserved for longer than a few days? What vegetables can be used in the infusions? I have been drinking infused water only for 8 days and would like to know how to keep my bowel movements regular. It seems difficult without some type of assistance like prunes, etc. I also recently started to jogging and make diet plan for lose my body fat After consulting my trainer, he suggest me for use cycling and taking more water for to reduce weight and belly fat. thanks for sharing this article. This would really help me.